Recognition. Education Center in Cosmetic Surgery. 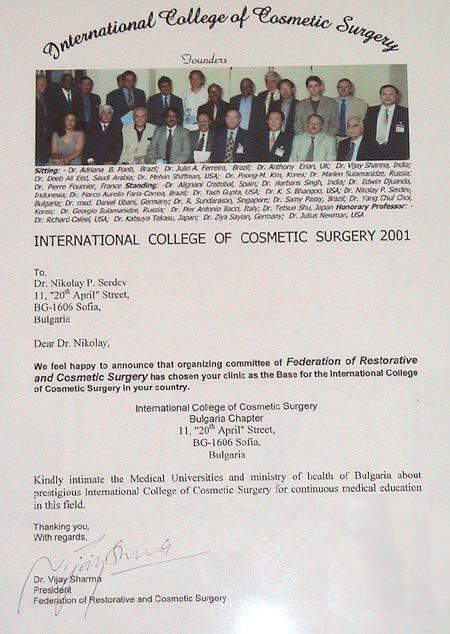 Back in 2001, the organizing commitee of Federation of Restorative and Cosmetic Surgery chose Serdev Clinic: Medical Center “Aesthetic Surgery, Aesthetic Medicine” to be the Base for the International College of Cosmetic Surgery (ICCS) in Bulgaria or, in other words, the Bulgaria Chapter of ICCS. Thus, the clinic became a cosmetic surgery education center for surgery professionals in this field. 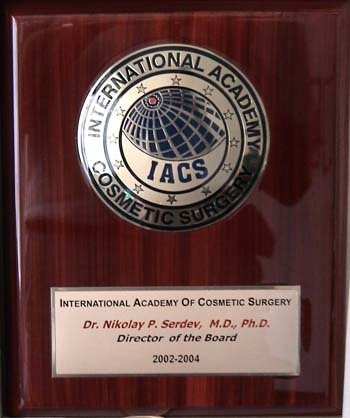 Less than two years later Dr. Nikolay Serdev was certified with an academic degree of International Professor for Fellowship Assesment in Cosmetic Surgery of the International College of Cosmetic Surgery – Worldwide, allowing him to teach and assess surgeons all around the globe. In 2006, the Academic Council of New Bulgarian University awarded Dr. Nikolay Serdev as an Honorary Professor for his practical and research contribution in the field of cosmetic surgery. He is the director of the program for International Postgraduate Specialization in Aesthetic Cosmetic Surgery and Medicine in NBU. From 2007 to 2012, and also as Director of the Board of International Academy of Cosmetic Surgery, he was a member of the examination committee of the International Board of Cosmetic Surgery. In its function as education center in cosmetic surgery, the clinic hosts a number of introductory one-day courses in Serdev Suture® Lifts each year. These events are attended by surgeons from all the corners of the world and provide valuable knowledge in anatomy, “danger zones” and scarless, a-traumatic beautifocation and/or rejuvenataion, via theory lectures and live surgery demonstrations. Hands-on training are organised upon request. Detailed information about the courses can be found here. For questions, please contact us. Aside from implanting biocompatible Biofibre artificial hair, Dr. Serdev has been working with the manufaturer Medicap® as a lecturer, presenter and teacher in the methodology. You can read details about Biofibre here. Clinical studies are available here. If you are a medical doctor and wish to be trained in implanting Biofibre, please contact us. "I want to say that it has been an honor for me to participate in your training and to see the incredible results of your technique. I am happy to learn. You [Dr. Nikolay Serdev] are really a brilliant mind with the humility of the great."